Looking for a financial sounding domain name for your company, professional name, or a specific service, but all the .com domain names seem to be taken up? Sure, you can register the usual .biz, .net, or .co to try to have a popular sounding extension. But, why not consider a domain extension that is more directly branded to your financial business or profession? The top reason financial planners have stayed safe by registering .com domain name extensions is fear that Google will not place their websites favorably in search engine results positions (SERPs). Honestly, that may have been a possibility when extensions were limited to .com, .org, and .net. But, eventually, the sheer number of domain names purchased provided financial opportunity to domain name registrars and necessity for Google to start treating all extensions equal. That day has come. According to Google, all TLD extensions are equal in Google’s eyes. The .com era brought a level of trust along with it. Companies registered .com domains. Non-profit organizations registered .org domain names. Internet services providers and IT companies purchased domains sometimes with the .net extension. 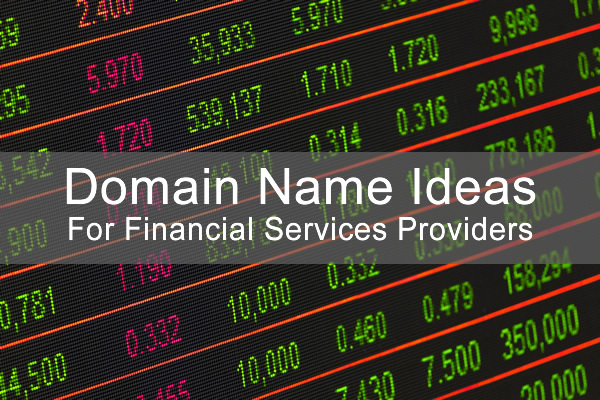 Today, financial domain name extensions can be very specific to the point of actually INCREASING your branding directness. The .finance extension is a good option for a website that produces information content related to finance and investing. moneyandfinance.com is a domain name that is owned by someone, of course, but it is only a parked domain at the time of this post. If you want to buy it, the owner will gladly sell it to you for a mere $5,999.00! And, that’s per year! MoneyAnd.Finance is available, however. No one has registered it to date. It is considered a “Premium Domain” so there is a bit of a higher cost at $129.00/year would certainly be taken already. The .financial extension is a great way to upgrade a domain name from an existing, longer, company domain name into something more succinct. Maybe you registered XimbobbleOWinskyWhammyBar.com that doesn’t even have the word financial in it. Now you could register XimbobbleWinskyWhammyBar.Financial and have a main keyword in your domain name. If your financial services target a specific city, you could include that in your domain name as well such as ForeverZebraCleveland.financial. The word “guru” has earned a bit of a pompousness about it. I would never register a domain name for my own company or namesake and use the word .guru in the domain. However, some people might find benefit of holding themselves out to the world as the undisputed financial guru in a certain investing or financial sector. .guru would be a good use in that case. The .guru domain would particular be a good idea for an online discussion forum where there is no one person claiming to be the guru but more of a knowledge bank where everyone contributes. The .guru in that case would be the quality of content as a whole supplied by many people in the financial industry. Wouldn’t you love to own a domain like BetterMoneyInvestments.com? You could! It’s available (as of this writing) for just $12.99. But, you could also shorten the domain a few letters by getting BetterMoney.investments. Either way, this is a potential winner for a domain name. There are two big search terms in it. Plus, the word “better” infers that there is some filter of bad money investments so that only the better money investments are displayed. Since this is a money-oriented domain name, it will have a higher annual charge of $129.99 than a standard company name extension of .com. But, the potential could be huge for the person that jumps on this one. A mortgage related domain name seems to cry out for taking action. Mortgage rates change often often enough that urgency could be created through promotions with the .mortgage domain name extension. “Get your mortgage refi in by 5:00 p.m. this Friday or rates are sure to go up!” for example. GetABetter.Mortgage or RefiNow.mortgage. My only hang up with this one is that a high percentage of people would misspell the word mortgage if they tried to type it into a browser window to get there. So, it would be best if on a business card or a link on website or used in a blog or social networking post. Financial companies do have partners. The .partners domain could be used for an LGBT couple to showcase a marriage event. Or, the .partners domain name extension could be used to provide specific news about partners in the law firm or financial agency. Finally, for the tax accountants, .tax is a simple domain name extension you can use to attract more business. For big companies with an HR department, the .tax domain name is an easy domain name extension you can use to redirect to a page on your large company website. As you can see, the possibilities are endless when it comes to coming up with financial planning related domain names. The trick is to write down the ideas you have and then narrow your list into the few remaining that are actually available and then way cost versus value from there. Get your search started now and register your domain name in confidence as we’ve been managing domain names here at BestDomainPlace.com since 2003.